Chances are you have asked or answered this same question. It’s true, the look and flavor of this festively fizzy, strangely sour and slightly sweet natural drink is quite intriguing. I have been enjoying kombucha for the last year or so. At first it wasn’t the probiotics or other health promises that did it for me, although those are quite the extra bonus, but it was the way it tasted! Kombucha is a fermented drink, first recorded in Asia more than 2,000 years ago, made with brewed tea, sugar and bacteria that is introduced from a starter culture. The sugar feeds the yeast and bacteria to help it grow and as it grows it starts to ferment. The key to kombucha is the ‘mother,’ a live starter culture similar to a sourdough bread starter. It’s slimy, it’s strange and it looks like a mushroom, but it’s called a SCOBY (Symbiotic Colony of Bacteria and Yeast). 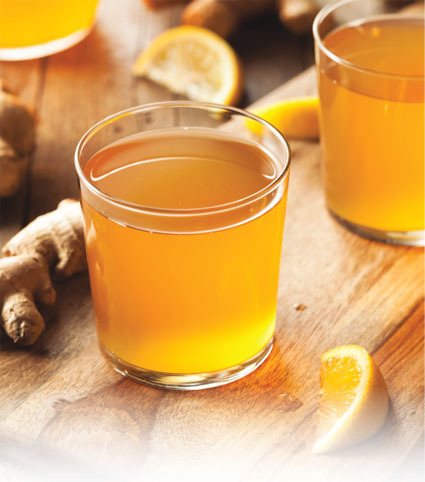 Kombucha is said to detoxify the body, aids digestion, contains vitamins, boosts energy, and some even say that it can help reverse the symptoms of cancer. It’s big claim to fame is as a probiotic. It helps restore the ‘good’ bacteria in the body and enhances gut health. So, if I have now intrigued you, I hope you stop by the produce section in any one of our Martin’s stores and grab a bottle of Kombucha in a flavor that is just right for you! We also have a couple fresh Kombucha varieties ‘on tap’ at our Martin’s in Granger. Go on! Try it if you’ve been curious. Those things floating in there are GOOD for you and there’s nothing to be afraid of. Cheers! April Howell is the Chef and Cooking School Coordinator at Martin’s Super Markets at Heritage Square.